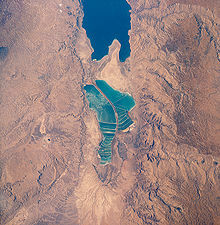 Yām ha-Melaḥ (help·info) (ים המלח), meaning "sea of salt" (Genesis 14:3). 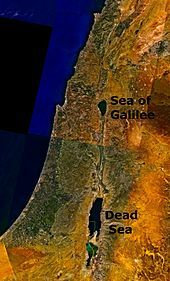 The Bible uses this term alongside two others: the Sea of the Arabah (Yām ha-‘Ărāvâ ים הערבה), and the Eastern Sea (Yām ha-Mizraḥî ים המזרחי). 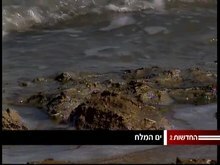 The designation "Dead Sea" never appears in the Bible. 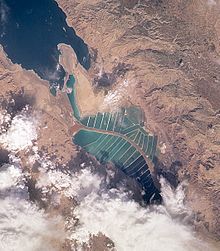 al-Bahr al-Mayyit (help·info) ("the Dead Sea"), or less commonly baḥrᵘ lūṭᵃ (بحر لوط, "the Sea of Lot"). Another historic name in Arabic was the "Sea of Zoʼar", after a nearby town in biblical times. The Greeks called it Lake Asphaltites (Attic Greek ἡ Θάλαττα ἀσφαλτῖτης, hē Thálatta asphaltĩtēs, "the Asphaltite sea"). 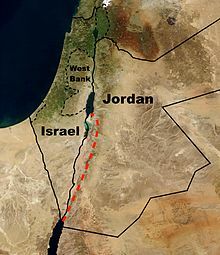 To the west of the Dead Sea, the Judaean mountains rise less steeply and are much lower than the mountains to the east. Along the southwestern side of the lake is a 210 m (700 ft) tall Halite (mineral) formation called "Mount Sodom". 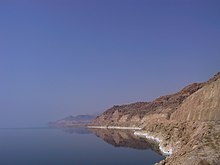 The Dead Sea's climate (BWh) offers year-round sunny skies and dry air. It has less than 50 millimetres (2 in) mean annual rainfall and a summer average temperature between 32 and 39 °C (90 and 102 °F). Winter average temperatures range between 20 and 23 °C (68 and 73 °F). The region has weaker ultraviolet radiation, particularly the UVB (erythrogenic rays). Given the higher atmospheric pressure, the air has a slightly higher oxygen content (3.3% in summer to 4.8% in winter) as compared to oxygen concentration at sea level. Barometric pressures at the Dead Sea were measured between 1061 and 1065 hPa and clinically compared with health effects at higher altitude. (This barometric measure is about 5% higher than sea level standard atmospheric pressure of 1013.25 hPa, which is the global ocean mean or ATM.) 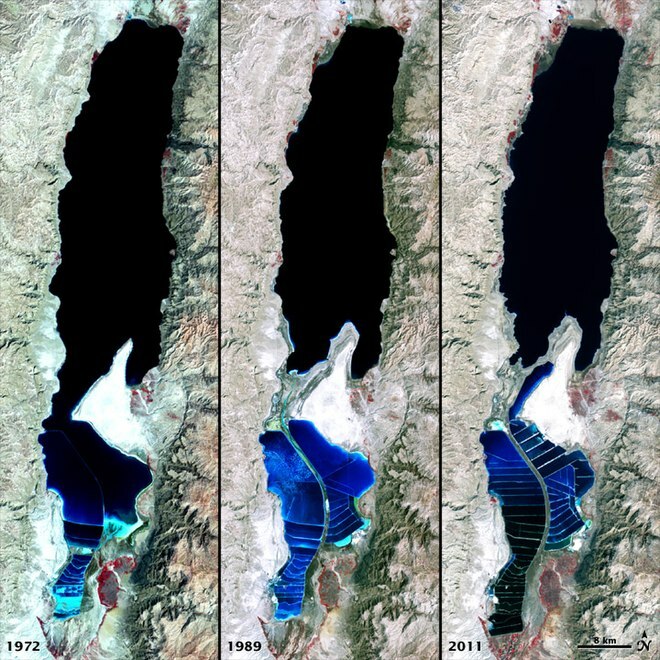 The Dead Sea affects temperatures nearby because of the moderating effect a large body of water has on climate. During the winter, sea temperatures tend to be higher than land temperatures, and vice versa during the summer months. This is the result of the water's mass and specific heat capacity. On average, there are 192 days above 30 °C (86 °F) annually.